COLUMBIA, Mo 05/22/15 (Beat Byte) -- US Senator Claire McCaskill's husband may become a new owner of the Columbia Housing Authority (CHA), if an expansive plan to privatize the public agency succeeds. Joseph Shepard's Sugar Creek Capital is one of four private investors listed on an August 2014 CHA memo about the agency's progress in the Rental Assistance Demonstration program (RAD). 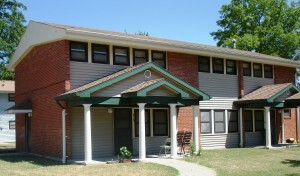 A US Housing and Urban Development (HUD) effort, RAD uses Federal and state tax credits to move private money into working down an estimated $27 billion backlog of maintenance on aging public housing units nationwide. In partnership with a group of limited liability companies (LLC's) CHA director Phil Steinhaus created last year, Sugar Creek will join RedStone Equity Partners, Gardner Capital, and Midwest Housing Equity Group to renovate 430 publicly-owned apartments in four locations. It's the second attempt in a decade to change the face of public housing in Columbia, a dreary throwback to a bygone era tenants, neighbors, city leaders, and even casual observers agree needs a fix -- RADical surgery, perhaps. But how? With the private money comes private ownership and control. RAD -- an acronym that also means "super cool" -- transfers newly-renovated (or demolished and rebuilt) rentals from 100% public housing authority ownership and oversight to the Section 8 program, which provides vouchers for tenants to use with the private landlord of their choice. HUD contracts govern Section 8, requiring annual rental inspections, compliance with several pages of regulations, and public housing authority (CHA) oversight. But ownership -- and the control it provides -- stays with a private landlord. The RAD result is "some kind of hybrid, where rents will stay low (at least for a time), tenants may have more mobility but fewer rights, and the total stock of affordable housing could shrink yet again," the American Prospect reports. The "hybrid" nature of CHA's RAD plan is evident in a 2012 request for "Developer Consultant Services." CHA's "vision of revitalization" emphasizes not low-income housing, but rather, "mixed-income programs for people of all economic strata, races, and cultures. To this end, it contains a mix...of low income housing and possibly, market-rate units." At first glance, the plan sounds attractive. It would desegregate a last vestige of Jim Crow in Columbia. It might reduce crime, though Section 8 housing has been notorious for high crime rates. It would also provide better quality housing. What it will not do, however, is much to alleviate poverty. It involves no path to tenant ownership, and in a perverse way, completes a vast and unjust land transfer -- roughly 160 acres -- from the black community to the white community that began with Urban Renewal, blight declarations, and eminent domain 60 years ago. RAD is also time-limited. After 15-20 years, the new owners can leave the program. What then, for residents forced into this cycle of public housing dependency by Urban Renewal? "Critics of the Federal public housing program wonder why residents seem to remain chronically dependent on this housing," the publication Next City reported about RAD. "Recent reports have shown that public housing reforms geared toward poverty deconcentration might not actually assist in poverty alleviation and that the pathways to leaving housing assistance are not fully understood." The RAD program itself has also been the subject of nationwide controversy.